Trading options has been my go-to strategy for the last 27 years. In my The Rich Investor emails to you I’ve served up plenty of examples of my four favorite option plays – three of which are selling-oriented. Those three strategies include: selling covered calls, selling option spreads, and selling put options. Today I want to explain why I love it when the market is erratic. In a nutshell, it’s because it makes options contracts more expensive. And when you’re an option seller like me, more expensive options mean more money in my pocket. The premium is determined by various factors that exist in the marketplace at that moment in time. The price of the stock. It’s the last determinant – volatility – that we will discuss today. Volatility, as used in options trading, is a statistical measurement that considers how the stock has fluctuated over some period of the past, known as “Historical Volatility” (HV), and how the stock is expected to fluctuate over some period in the future, known as “Implied Volatility” (IV). The more erratic the fluctuations have been (and are expected to be), the larger the volatility component, and vice versa. Just the sheer fact that a stock has been erratic (or not erratic) has a huge effect on the price of an option. And so it makes it an obvious fact that, if you’re a seller of options (like me), you would want the volatility to be high. This will ensure that you will receive more money in your pocket. But how do we really know when volatility is high (or low), and how can we be so sure that higher volatility translates into higher option prices? We consult a volatility chart and an option calculator. Don’t confuse this chart will a typical price chart. Looking at volatility charts can yield great information about how erratic a stock has been, and how option market-makers expect it to be in the future. During times of complacency, when markets are in a nice slow uptrend, volatility measurements tend to fall, and vice versa. You can imagine then, that when stocks drop big and fast like they did in December, volatility will spike. On the DIS chart above, the blue line represents the 30-day volatility of actual closing prices. You can see how the line trended lower from March to September, which coincided with a very flat-to-slowly rising stock price period for DIS. You can also see the blue line trended higher from September through December, which coincided with the nasty sell-off we experienced. As such, historical volatility moved from a low 10% to 30%. Drops in the market = higher volatility. Uptrends in the market = lower volatility. 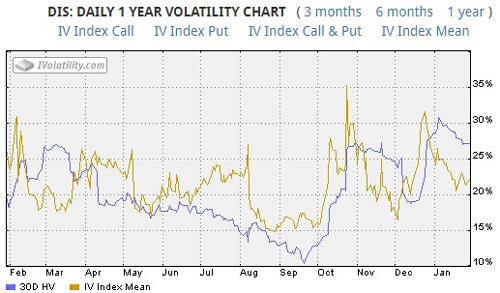 Now, the orange implied volatility line represents how the options market-makers in the trading pits expect DIS stock to fluctuate going forward. Many times it can mimic the historical volatility, but many times it can deviate. In Disney’s case, implied volatility traded in a 20-point range, moving from a low of 15% to 35%. So, how does this all translate into more money in our pockets? Below are two snapshots of option calculators that yield the results of DIS call and put option premiums when the volatility input (left-hand side) is changed from 15% to 35%. Clearly, when the volatility component is raised from 15% to 35% (133% increase), the price of both the call option and put option rose 135% and 120% respectively. As you’ll notice, the only thing that changed was the volatility component. Every other input was left unchanged. This shows the power of volatility on the outcome of an option’s price. In just three months, from September to December, you can see how expensive it became to buy DIS options. This is an option seller’s dream come true. Receiving premiums that are 135% bigger just because DIS stock fluctuated a bit is what I call a sweet deal.